Computers are the most used innovation that has come up so far. It connects the bridges on people and allows us to have communication with our loved ones that are far from us. However, using our computers often can cause problems and eventually slow them down when we don’t take action on fixing them. Remember to free up your disk space using disk clean-up or disk defragmenters. Unnecessary files like temporary internet files can slow down your computer so get rid of them, empty your recycle bins frequently, and make sure that your important files are placed on the external hard drive. Scan for viruses and worms, spyware and adware. Always check for these nasty programs because they make your computer work slowly more than anything. You need to purchase PC fixer software that can remove these programs. Clean up your desktop. If your desktop is flooded with files your computer will eventually function slowly. Uninstall unused programs. Your computer might have lots of unused programs installed on it; uninstall them because once a program is installed, it makes a connection between the program and the operating system which also make your system run slower even if you do not use them. Do not start up programs automatically when turning on your computer. Make sure that you close programs you do not use that open when you start up your computer. Defragment your hard drive. Defragmenting your hard drive places all of your information for each file in one place which will result to a faster computer experience. 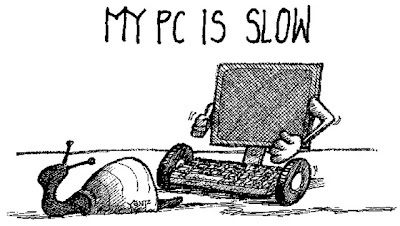 These tips on how to speed up my PC might be able to solve your problems on your slow running computers. Following these tips are a big help on your troublesome computer systems. I think it is also good to highlight the importance of looking at a computer's administrative services. Some of them are turned on by default. Unused or seasonally used programs and services have to be taken care of. When I upgraded to Vista, I didnt like the defrag tool that came with it. So for defragging I got one of the popular commercial defragmenters that also has a VSS option for Vista that avoids unnecessary shadow copy activity and can defrag in the real time mode. I also agree its important to limit the programs loading at startup and in fact programs that are installed as well.